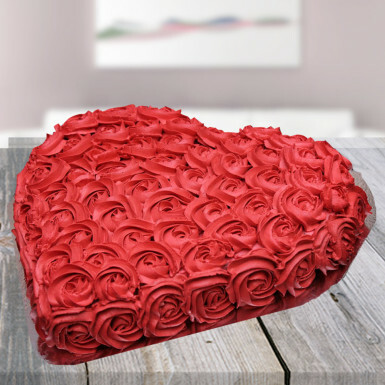 Order this love cake - a fantastic strawberry heart shape rose cake. This cake is the right thing to order on your loved one’s birthday. Make your special one feel loved and tell how special she is. It tastes really delicious and it is surely going to be the best cake that you have ever tasted. Valentine’s Day, Birthday, anniversary, kiss day whatever the occasion which makes you want to surprise the love of your life, this cake is perfect! Order this amazing cake and makes her day vivid and incredible. Eggless cake is also available and for this you have to click on checkbox button . You can also customize your cake. Extra charges will be charged for changes. ordered this beautiful cake from winni...the delivery was fast and cake was really beautiful and fresh...recommending to friends and family ! !